VIEW OUR REAL TIME TESTIMONIALS ON FACEBOOK! I highly recommend Liz and her kittens, we have 2 absolutely wonderful boys because of her. Our boys are Max and Nik, you can see from the picture how beautiful they are what you can't see is how very loving they are. One or both is always under foot, my only complaint is even at 18 months old, they still think they can defy gravity, and leap and jump all over the house. Liz is great. She has been there for me, answering any questions or concerns I may have. We are still in contact, exchanging emails and pictures. Liz shipped the kittens to us in August of last year. There were storms on the east coast and the boys were held up at another airport, even with that they arrived safe and sound, just a little tired from their long day. As it turned out, I was glad we got 2, they were able to keep each other company during the trip, and now they have each other to play with. I probably could go on forever about my kittens and how good Liz has been to us, but I will just say you will not regret adopting Scribbles, who is absolutely gorgeous by the way, and if you decide on Charlie also, I know you will be thrilled. PS - Liz, I gave them a your hug! I am not exactly sure what questions you may have but as Liz said below I have adopted two wonderful Siberian’s from her. 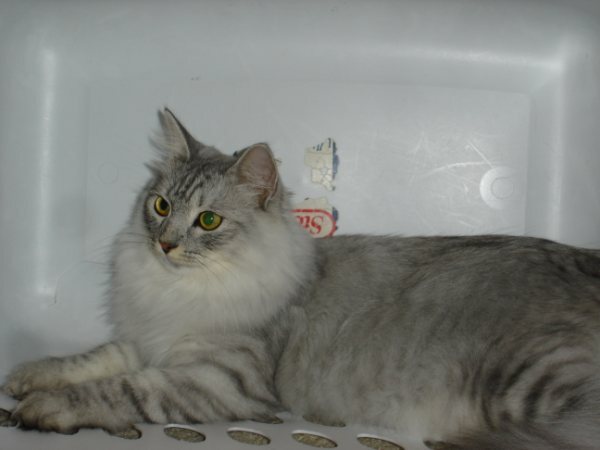 She is a very trustworthy person and is someone I have recommended to others to purchase a Siberian from. I met Liz about a year ago and have gone out to her house and seen all of her beautiful kitties. 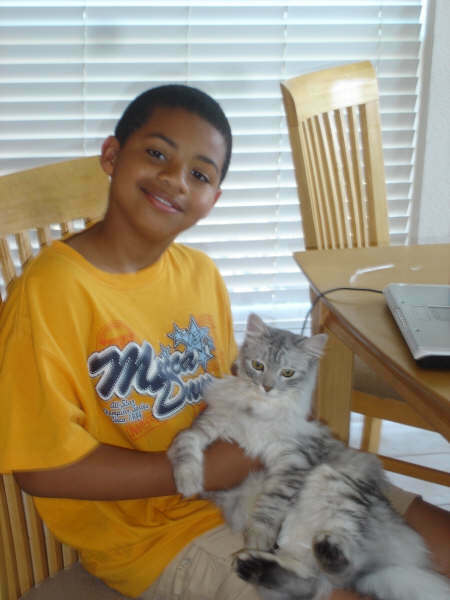 In fact the photo of Jamal and TJ… well TJ is my husband. 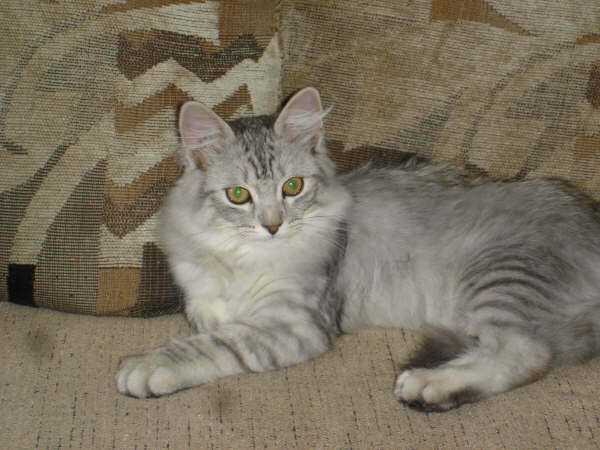 Liz tells me you are adopting Scribbles, she is my favorite and I am glad to see she got a great home… I almost adopted her myself but I am afraid three Siberians makes a houseful and four would be too many, so I had to pass. (my husband has one he adopted before we got married) Liz is a very honest and trustworthy person, she has a big heart and is very true to her word. My first kitty I purchased from her is one of Jamal’s kittens and he is just a joy, we named him Koda and at 5 months old (in a few weeks) he is just amazing… he loves to go for car rides and cries when I don’t take him with… The second furry family member I adopted from Liz (Sayan) came by funny circumstances… a former client of hers could no longer care for the kitten she purchased and chose to return him to Liz (as per the contract)… Well, long story short, I picked him up at the airport for Liz and brought him to my place, where she was going to come get him from me… We (family and I) fell in love with him and I made arrangements with Liz to adopt him at once. Her kittens are very healthy and very friendly, of course being raised with the twins I wouldn’t expect anything less and being a former professional handler of dogs, I can honestly say I wouldn’t purchase an animal from anyone without checking them out first. I would never hesitate to recommend Liz to anyone, she is truly a great breeder who stands behind her contract and is very trustworthy. If you have any questions I can answer for you or if you just want to talk feel free to contact me. Liz, It would be my pleasure. I can not tell you how happy we were to have found you . You were wonderful, a pleasure to deal with for sure ! 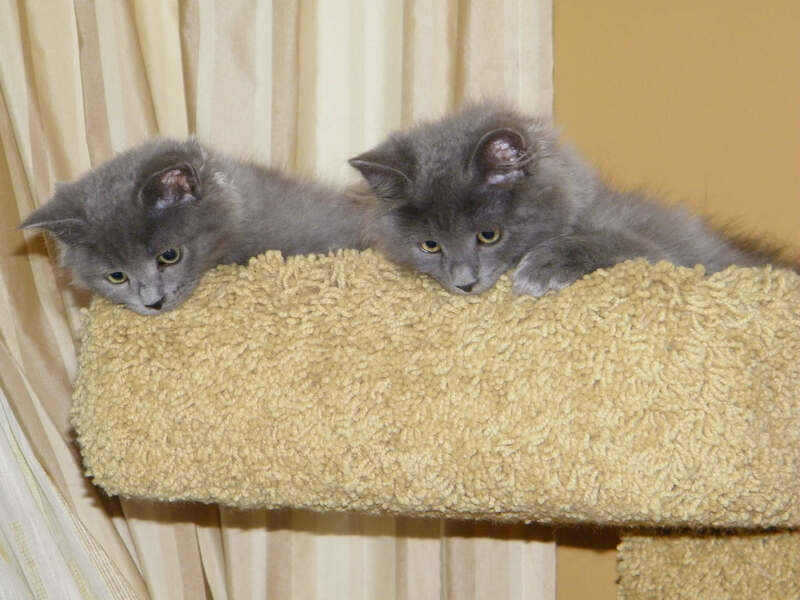 The kittens are perfect you could see that you took excellent care of them! I will email her and it truly would be my pleasure. This is Melissa from Kings Park. I just wanted to write you to let you know that everything is going great with our new little family member!! She is so beautiful and even more sweet!!! She is the most social cat I have ever known. Everyone in our family loves her soooo much!!! I check your website all the time and I was so happy to see the good news today. We would be interested in a kitten from the summer litter. Who is the mom of the litter and about when would the kittens be born? 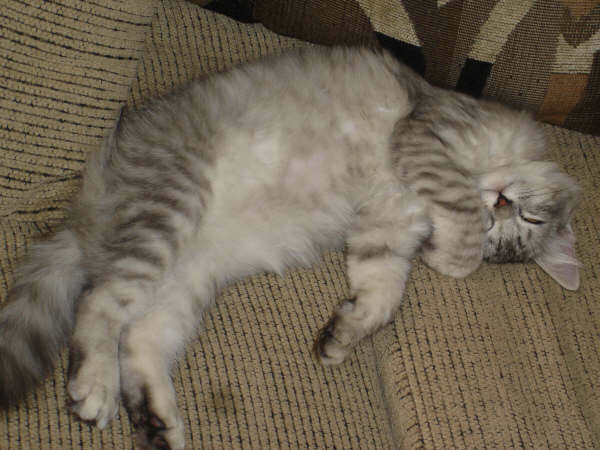 I have attached a picture of Peaches. Talk to you soon. Thank you for the best pet ever!!! I haven't written in awhile so I thought I would get you caught up on the boys. They are growing like crazy and are such little loves, Max likes to snuggle in the middle of the night and Nik will curl up in my arms like a baby and go to sleep. At 9 months old, Max is just over 11 pounds and Nik is about 10 1/2 pounds, Nik is staying just about half a pound less than Max. I think when they are all grown they're going to be huge. I wanted to check-in and update you on how fabulous Taneya has transitioned into our family. She is so beautiful with such a wide variety of colors in her coat. The pictures do not show her brown shades on her back. 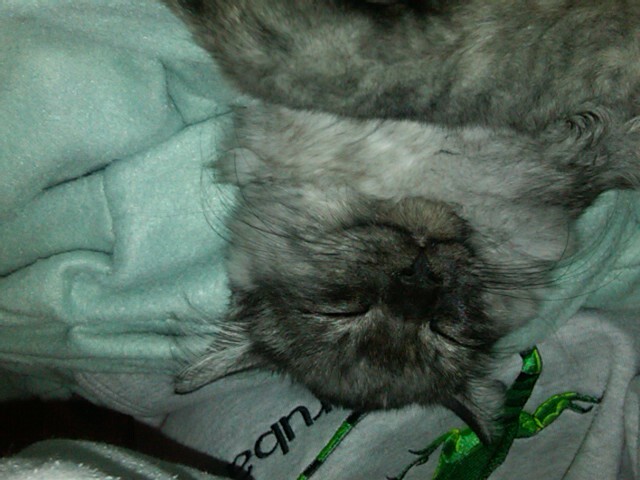 Her coat looks and feels like a chinchilla fur.Her temperament is so calm and playful. She has added so much to our family. It's crazy thinking we waited this many years to find our final family member. Thank you for all that you do adding joy to others lives. One picture is from when she was a kitten (8 weeks) the others are her now at 11 months. 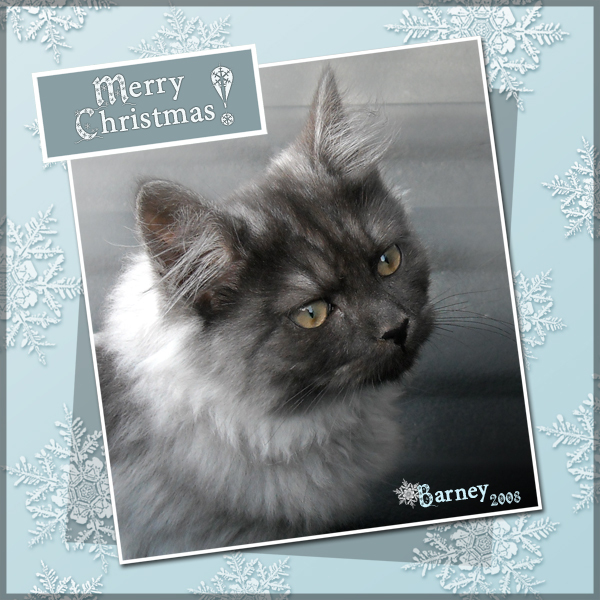 Barney and I just wanted to wish you and your family a wonderful Christmas. We have been at my parent's house since Saturday and we'll be flying back in just a couple short days. Barney has been amazingly good! My parents LOVE him and can't believe how friendly and fun he is. My dad even likes to play/tease him:) He did really well on the flight home. He meowed when the plane took off and landed since he his carrier had to be put under the seat. We even had a longer delay on our layover due to the snow but he was just so good! The rest of my family and friends can't believe how beautiful he is. Me either, I am so attached to my little guy. I better get moving but I just wanted to drop you a quick hello and wish you a merry Christmas. Did you guys go anywhere or have any company? Either way, I hope you are enjoying your time. I attached a photo of Mr. Barney from a few weeks ago. 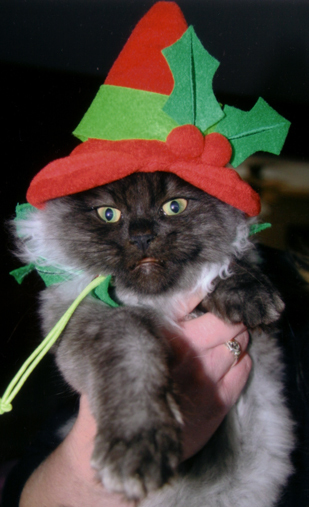 I took him to see Santa and have his photo taken at PetSmart but it didn't turn out the best. So, I took him out in my truck and snapped a few photos. Yeah, the vet REALLY likes him. I took him in last weekend and her face totally lit up as she opened the door and saw him.... then she said 'hi' to me:) She said he reminded her a lot of her norwegian forest cat that is her baby. Getting caught up with vaccines as well. His vet told me she does not like to give purebred cats more than one shot at a time, she is very cautious with them and does things differently than with general cats. So, I'll be taking him back again this weekend but he likes to ride in my truck and I think he even likes going there. They all oooooo over him when the see him, the girl at the desk refers to him as her 'favorite Siberian'. She also said she had been researching Siberians a little bit more and thought Barney was the prettiest of all she saw on websites. My parents are coming down here at the end of April for a weekend to visit. My mom said she 'really wants to see Barney'! I'm hoping she's looking forward to seeing me too:) Seriously, Barney has stolen the hearts of so many people that never really cared for cats. 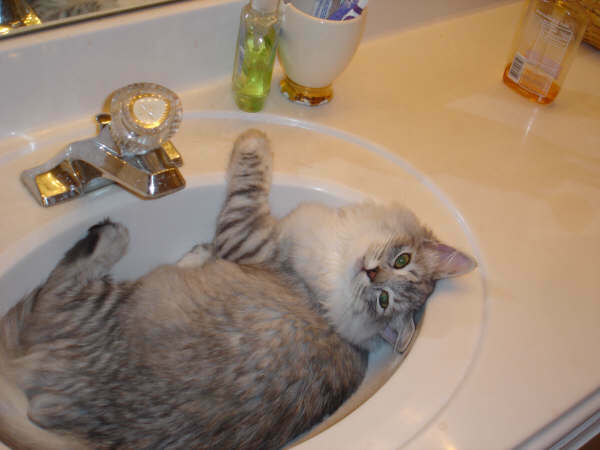 My aunt in California is a total 'cat person' and has had several that have been her precious 'babies'. Anyway, from the photos I've sent to her, she told my mom that he is the prettiest cat she's seen! Are you encouraged and feeling confident???? Your cat's make beautiful kittens and it's clear how much you pour your experience and heart into each and every one of them! I would love to get a roommate for Barney... someday. He's all I can handle right now:) I definitely know where I would adopt another one if and when I am ready. I am so thrilled for you that you will be having more kittens! They are all so precious. Sounds like you are doing well.... and are quite busy! I imagine your daughters have you on your toes too! They growing up really fast? You really touched my heart in sharing the story about them with me. You have touched my life in such a special way. How are you? The kitten arrived at the airport at 4:16 safely and comfortably. His blanket was still dry, he still had some water, he was very clean, and seemed comfy. when we got in the car, I opened up the cage and he stepped right out and played and purred and sat in my lap and then hopped about. I gave him a bit of your dry food in a plastic container I brought with me and he ate that. Then he splashed some water in my face...LOL. When we got home, he jumped and played and played and played and used the litter box and drank and ate and is as happy as can be....and now hes sleeping under the table on the rug right next to my feet. I am so happy!!! He is sweet and gentle and brought such joy to me when I saw him (even tears). He is in good hands and very comfortable. I have a video of us cuddling and playing in my room. I will send it to you A.S.A.P. He's just great and I love this little kitty. Subject: Re: Hows the kitten? Tahsha is doing great. Using the litterbox. Sleeping in her bed - a lot. Doesn't wake me up at night meowing. Uses scratching post. Plays with all her toys. It took until yesterday for her to acclaimate to me, but now she will run over to me to be pet. 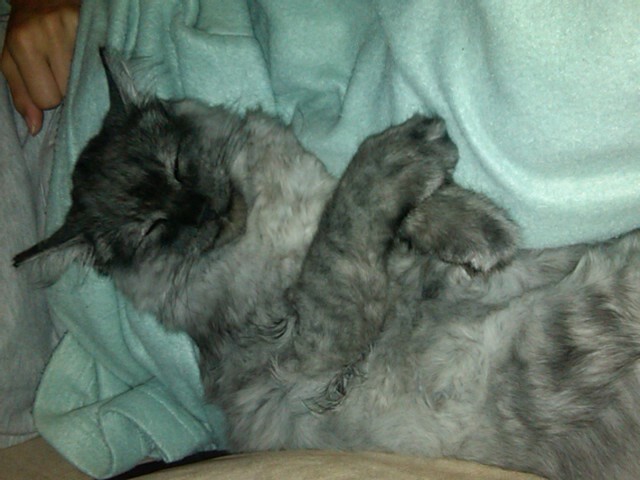 Here are some photo's of the cat. He is a joy. We are blessed to have him. Thought you'd be encouraged. People just love our cat and his coat. He is quite social. He thinks he's part lion and puppy! He's a real hoot! So next month, he will be a year old! Hope all is well with you. Thanks again for my precious kitten. He is divine!! Everyone adores him and fawns over him. I also had a friend come over that is deathly allergic to cats, He had no issues at all! Yahoo!!!
. Here is Tiki with Christian and Matisse. He is doing great here with his new family and already knows where to go to the bathroom. The kids absolutely LOVE him. He is very cute and will get lots of love here at his new home in Colorado..
Thomas is doing great! The boys are crazy about him. They slept on a palet in the floor last night. Thomas slept above their pillows. He ate some canned food this morning, and has used his litter box several times. This morning he was purring and playing with his new toys. He rode home last night mostly in Adam's lap. He doesn't seem to be bothered by him so far. Thomas buttered him up nicely on the way home! Thought I'd give you an update on Chloe and how she is adjusting to her new home. She is extremely playful and very curious about everything! At first I thought she might be shy but she has adjusted very, very well! My friends and family absolutely adore her and love playing with her. She is so amusing to watch. Also, I have attached a picture of her. I am so sorry that it has taken sooo long for me to write you back! There was a virus on my computer and it completely crashed!!!! Primer is soooo happy in our home! Sienna is great friends with him! luckily. He was so tiny when I opened the crate and now hes gotten a lot bigger! Ill send some pictures once my computer is fixed and you can see how handsome he is!!! Thank you again and could you please inform us of the next litter you will be having. We are looking to adopt another male but black this time! Thank you again and I'll send you some pictures soon! My name is Bradley and I live in NY on Long Island, and I would like to tell you a story that should make you feel more comfortable about buying a kitten from Elizabeth Hart. 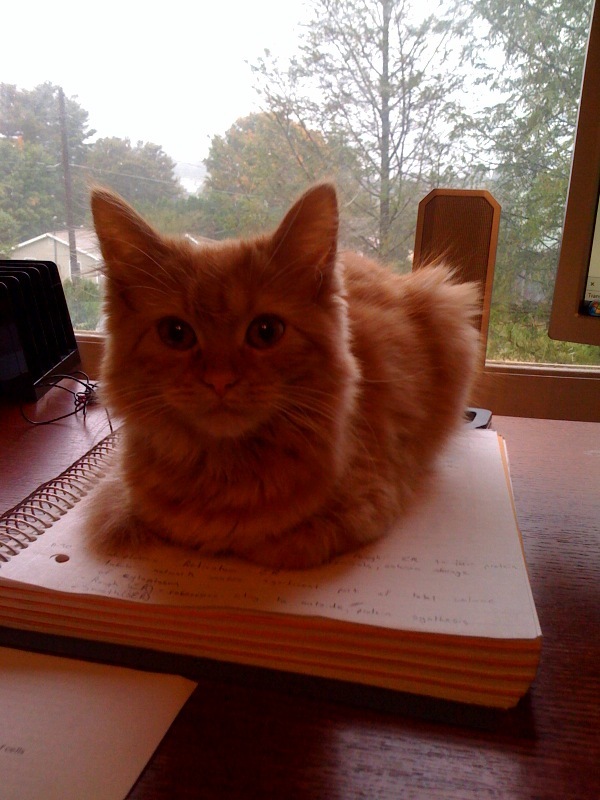 Back in January of 09 I decided to purchase a kitten from Mrs Hart. She sent me a contract to sign and information about care and nutrition for the kitten. 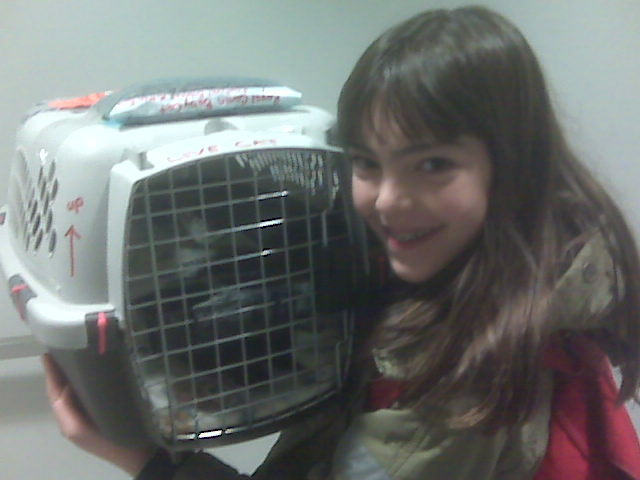 March 09 The cutest kitten in the world arrived at La Guardia airport and my daughter and I picked him up. We got him home and he fit right in and become a loving family member. He was taken to the local vet in the area and got a clean bill of health. Every thing was great, till that morning in April. We found our newest member of our family in his cat castle not moving. He had past away over night. 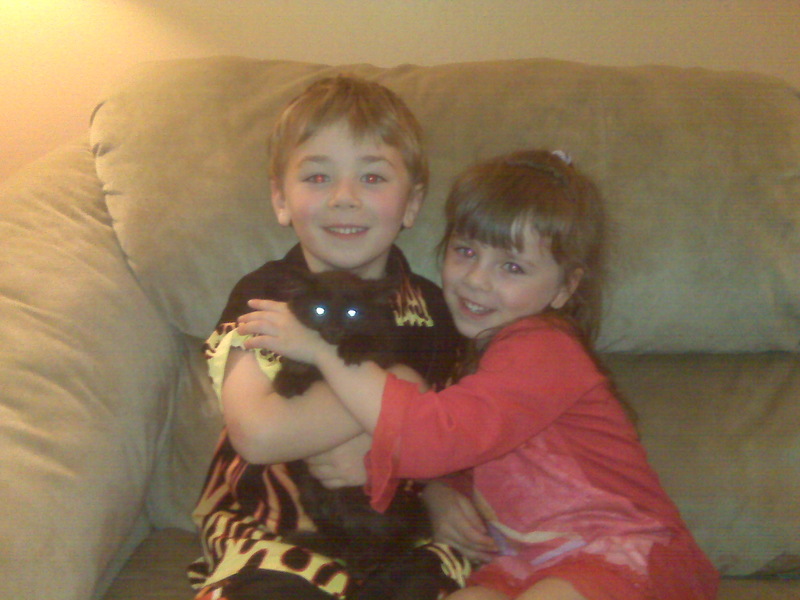 We were devastated, there are no words to describe how we felt when we found the kitten that morning. Mrs Hart told me that she was extremely sorry for our loss, and extremely sorry that this has happened. I told her it was not her fault by any means, but she wanted to send us a new kitten at no charge. I called Mrs Hart and again she apologized for our kittens death. 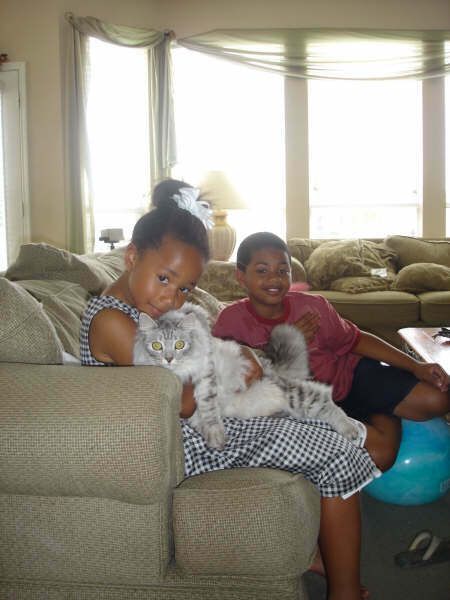 Again she insisted on sending us a new kitten and in August a new kitten arrived for us at La Guardia airport. 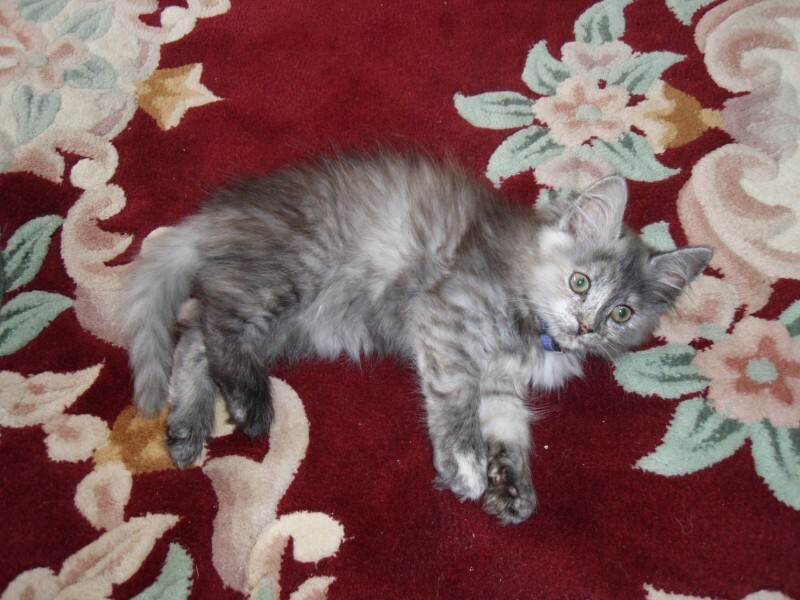 The new kitten is now 4 months old, and is doing excellent. By chance the new kitten just happens to be a full brother of the old kitten. Mrs Hart was so kind, and so concerned about us. In my opinion she bent over backwards to accomodate us and she didn't have to. I never made any insinuation that she should make some kind of restitution to us. Mrs Hart had already decided to give us a new kitten even before she knew the cause of death. Elizabeth Hart in my opinion is one outstanding person. She is knowledgeable, honest, and caring. She is the kind of person you wish you could deal with after that item you purchased craps out on you. She made every effort to make our family whole again. I will never be able to thank her for everything she has done for my family. The only thing I can do is let people know that Mrs Hart is the only person to buy their kitten from. Please place this in your testimonial if you like. As you know it is the truth. Take care and watch out for those pics I will be sending you soon.